So, you’re going on vacation – and we’re sure it’s well-deserved! Once you have your suitcase packed, your itinerary ready, and your cat-sitter hired, you’re just about ready for the time of your life. 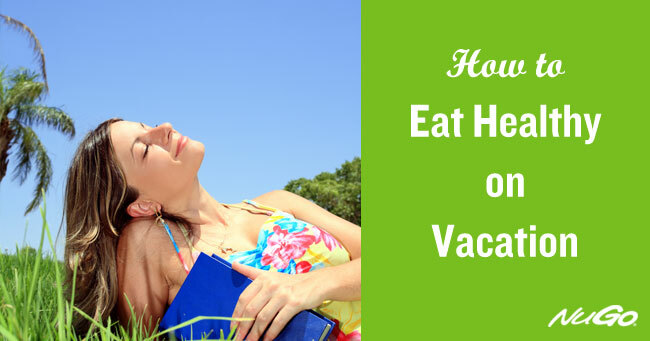 But there’s one more oft-overlooked thing you should consider: how to eat healthy on vacation, so you can make sure you’ll feel well enough to make the most of your plans! When on vacation, people tend to eat differently than they usually do at home. Whether you’re eating out at restaurants with bigger portions, trying local cuisine with unfamiliar ingredients, or dining at times that aren’t in line with your usual daily schedule, vacation-eating can throw your body for a bit of a curve. Since there’s nothing that can ruin plans quite like digestive issues, we want to provide you with some ways in which you can keep your digestion as regular as possible. Indulge in Moderation – Of course you want to try the food that your destination is known for! And of course you should! But to avoid overloading your digestive system with unfamiliar (or excessive) food, try to keep some level of regularity to your meals. For example, if you usually eat oatmeal every morning, try sticking with oatmeal in the morning, and using lunch or dinner time to try something new. Don’t Skip the Fruits and Vegetables – Yes, you’re on vacation and it’s the perfect time to shirk responsibility and lounge in a hammock for hours. But don’t give up on all of the “rules” of your everyday life. Add a side of vegetables to your dinner or eat fresh fruit in the morning to give yourself the vitamins, nutrients and fiber that your body needs. Stay Hydrated – If you have a busy schedule full of exciting activities – or even if you’re just hanging on the beach all day – it can be easy to forget to drink water. But without proper hydration, you may feel tired, have headaches, and just be generally thirsty. Pay attention to what your body is telling you, and aim for the recommended 8 cups per day. Bring Some High-Fiber Travel Companions – Packing a few Fiber d’Lish bars in your luggage can help you to avoid the buzzkill that is Vacation Constipation. Have one d’Lish bar every day, and you’ll be able to enjoy your vacation without feeling weighed down. See all 10 flavors. This entry was posted in Fiber d'Lish News.